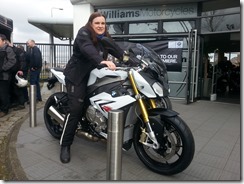 Today we visited the BMW launch event at Williams BMW in Manchester. It was very busy but we were able to get a look and sit on the new S1000R. I was also able to get to grips with two other K1300s bikes and found both of their throttles to be smooth in operation. Mine has a real bad notchy feel as you initially turn the throttle. Could this be one of the cables or the grip itself? When I install the new audio wire for the SatNav comms, I think I will have a look at this and the throttle bodies again. This time I will also take the airbox off and actually look inside the bodies at the butterflies as well. After a free coffee and a Bockwurst in a bap with headed for Clitheroe and the Yorkshire Dales. We had a run up to Hawes and back on our usual route via Sabden, Sawley, Wigglesworth, Settle and Ribblehead Viaduct. We stopped just outside Horton-in-Ribblesdale at our usual tearoom stop. We prefer to stop here these days as it is usually very quiet and the owner is very welcoming. No major issues to report, the K1300s performed brilliantly with no hint of a sticking throttle. Helen was a bit rusty at first, but soon got the hang of her S1000SX. We had a nice quiet ride, more cars than bikes were out today around the Dales. My first opinion of the Garmin 350LM is a good one although there are things that I don’t like. Currently the unit is mounted a little bit too low for me and I find I have to really take my eyes off the road to see it. Obviously when I get the sound working I won’t have to do this as much. But I think I will install my other Ram Mount double ball clamp bracket as it is a little bit longer. The SatNav is very easy to use with a glove and ever button/icon I pressed on screen I hit first time everytime. It followed the route I had plotted on Basecamp to the letter and when I made a slight detour it was able to recalculate a route to get me back on track, without backtracking. One slight annoyance is that it gives you the distance to your final destination not one of the set points I had made on route. This information is stored on the trip/stats screen instead, which is a quick button press away though. I don’t like the 3D map view the Garmin uses I much prefer TomToms approach. Also TomTom gives you a much better idea of the severity of corners, Garmin seems to flatten them out more. I did notice that some sharp turns it actually thinks are junction turns and navigates as such. Not sure what the vocal command is though as I don’t have sound yet. I will have to wait till I have sound enabled to my helmet before a can make a proper judgement on the SatNav overall.